A green and yellow basket! Okay, okay! I won't sing anymore....today! 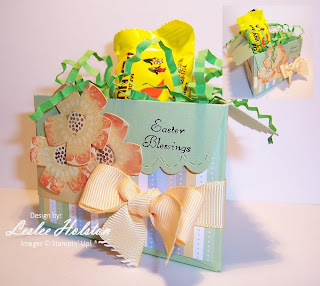 This adorable basket is so easy to make! I made this one for a make-n-take project at a recent workshop. They are easy enough to mass produce for an entire classroom of kids too. The basket is a triangle. It is made by adhering three Big Shot Scallop Envelopes together. Simply cut your scallop envelope dies with your Big Shot, trim a wedge off of each side of the bottom flap (otherwise it won't come together in a triangle) and adhere using sticky strip or SNAIL. I adhered a piece of 3" x 2" designer paper onto each side. This was mainly to hide the envelope flaps that hold the basket together. Embellish as you desire. I made more of my Rock-n-Roll punched flowers. You can see that post here. And, I wrapped it all up with some ribbon. Really fun to create and even more fun to give! Of course, I had to fill mine with a yummy Reese's peanut butter egg!! Try making one for yourself and thanks for stopping by.